So you have a five day holiday in the magic island of Santorini. Explore the breathtaking views, enjoy the golden sunset, and swim at the deep blue waters. Santorini is the ideal place to live a holiday of your dreams. Enjoy a warm welcome at the Athinios port of Santorini and relax till you arrive at your room enjoying the magnificent volcanic caldera view of the island. Go for an easy walk through the winding streets of Santorini and soak up the astounding natural views of the landscape. In the evening take pleasure in a superb wine-tasting session and treat yourself to a candlelight dinner at Thermes Luxury Villas. Visit in the morning hours the red beach; what make this beach absolutely irresistible are its impressive red rock formations, which form a breathtaking unique volcanic landscape. Swim at the crystal clean water, enjoy sunbathing and visit take a boat to visit the next beach which is named as white beach because of its white cliffs that surround it. At the afternoon visit Fira to have an amazing experience; take a tour with the donkey that are descending a very picturesque view. This will be definitely an unforgettable experience. In this way you will watch the sun going down inside the sea and gaze at the red coloured sunset. As it gets dark enjoy a chill out drink in caldera view in one of the bars of Thira. Today take a tour of Santorini's rich history by visiting the Archaeological Museum of Fira, accompanied by a certified guide who will unveil the many mysteries of this ancient island and its successive civilizations over several millennium. Walk through the alleys of Fira with its fine boutiques and shopping choices, and then relax in a café by the cliffs of the town with an alternative view of the caldera. Later in the evening watch the famous golden sunset in Oia. You will be amazed by the fairytale colours of the sun sinking in the blue water of the sea behind the sleeping volcano. Start your day with a 5-hour cruise to visit Old & Nea Kammeni and with its hot springs then venture to the secluded small island of Thirasia. Take a quick sailing tour and enjoy the view from the boat. Discover the hot springs and the black volcano pebbled beach. Enjoy the crystal-clean waters in the magic surroundings of huge cliffs. In the evening take advantage of the open air cinema in Kamari and relax by the side of your partner. For a special experience dinner drive or hike down the winding cobblestone steps to the little port of Ammoudi near Oia for a seafood meal with local wine or ouzo. Explore Fira’s shops for souvenirs and some gifts for your loved ones. Take a stroll in the afternoon in Oia’s paths and gaze at the multi-coloured landscape. Finish your day with the most amazing way; take a semi-private or exclusive sunset cruise around the most interesting parts of the island and enjoy a sumptuous barbecue meal aboard, watching the sun dip into the Aegean Sea. If you want to continue at night, Fira city offers many choices for a cocktail or drinks in caldera’s view. 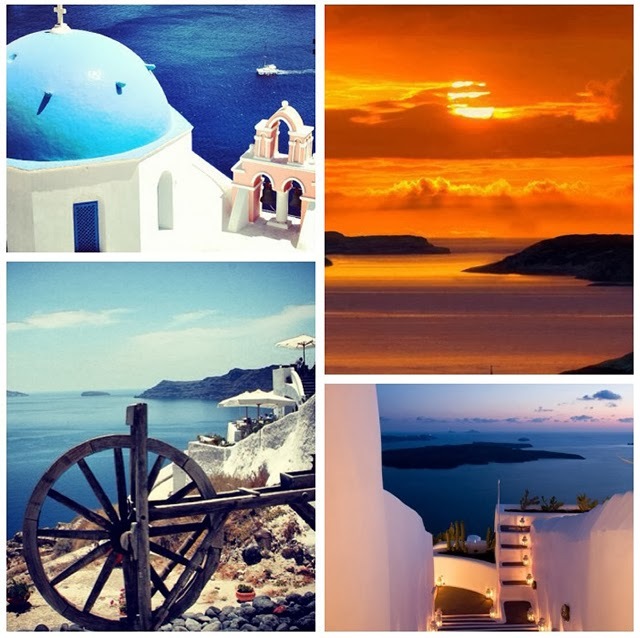 Follow Thermes Luxury Villas's board 5 days in Santorini on Pinterest.